Nope, clearly not. But regardless, I'm actually quite impressed by this so far. That's some serious distance. And nearly 2 swims per day for 6 weeks. In his pre-event commentary, he said this would be the point where he wasnt sure if he'd follow the welsh coast or shortcut over to Ireland and swim up that coastline. Will be interesting to see. I'd imagine they'll take the safer option of hugging the coast, even if it'll be a lot longer. That said, they have recently experienced cutting across a large expanse of open ocean going across the Bristol Channel, so maybe they will hit up Ireland. The 100 days was based on roughly 20 miles a day, he is averaging less than 8 miles per day. At this rate he will have to be swimming in the North sea for extended periods of time through the winter. I predict that this challenge will be aborted in the autumn. I remain deeply sceptical/cynical about this endeavour. Even at 8 miles a day it's 8miles more than I would want to do and I really don't understand why there isn't better tracking of his actual swimming and not just the boat route. And why is so he so happy in all the videos?!?! Anyhoo.... in other much more mainstream news some dude is swimming the length of the channel in 50 days... All over the sky news app. Weird how one thing is picked up and the other largely not!? The other dude (Lewis Pugh) swimming the channel has an actual international purpose and is well worth following. UN Ambassador for the Oceans and working very hard to address the demise of oceans and other inland water areas with unique wildlife. He's a bit more authentic and believable. It's a bit weird though. If they are cheating and only logging the boats location and just letting Ross swim a few hours a day....why are they doing so badly? And if they are giving it a honest go, why not provide better info? Still as said he's had the best possible weather, in the easiest seas and still made modest progress. When the autumn storms hit, he has had it. And if he is off the coast of northern Scotland at those times even the support boat will struggle! Still an impressive feat even if he quit today, but why make the ridiculous claims that he will do it in 100 days when that was clearly impossible for any swimmer! You only track channel swims via the boat.... why is tracking boat position a problem now ? 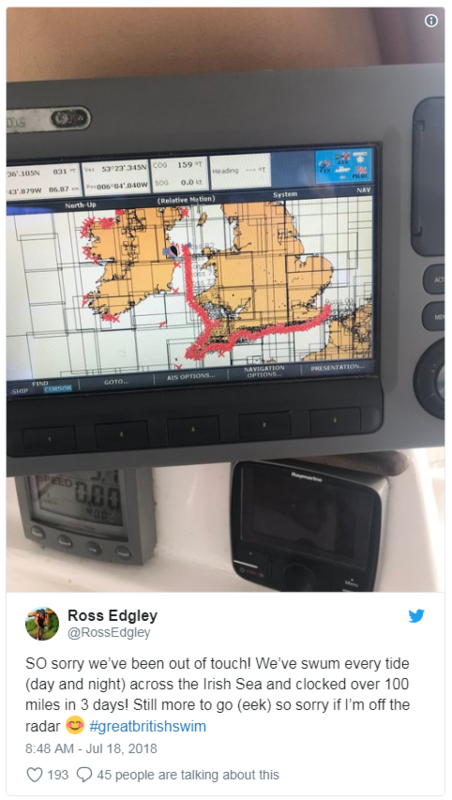 I think the difference between them is that on the channel swim it's one non-stop trip rather than the multiple times a day of getting off and on again with this challenge, no close tracking to show the boat going back to where he was picked up from for his rest/food stops. I don't think it is provided it's only done when he is in the water and the coordinates match the in/out locations. Channel Swims are continuous and as such it's bit more transparent whats happening. And this is the point. If it were clear what was being tracked that would make a lot more sense but there is nearly no transparency on what that tracker is tracking! This is a challenge conceived and promoted on Social Media, in an age of cheap and reliable GPS Trackers and Strava. It is not an old school attempt at distance swimming but a modern social media publicity stunt. The lack of GPS/Strava data in that context is all a bit odd. They could so easily update Strava after each swim which would provide a HUGE Social interaction with the attempt, I am sure they could easily have got Garmin/Strava to add a little to the kitty and help drive promotion further. Just seems a simple thing to neglect when it's all about promotion, unless there is something fishy afoot? Still if he has been in the water for 6-8+ hours every day for 44+ Days I still tip my hat to the guy, even if he's swimming on the spot! Could it be the reliability of Swim gps data? My recent 10.4km half Iron swim for example. 100 miles of swimming in 3 days? Come on. Most people would struggle to run 100 miles in 3 days. In fact, probably ride 100 in 3 days! Still, from the odd FB thing that has popped up on my feed, the fanboys are noshing it all down. Probably all those from IMJ! You could drift 100 miles in three days in the Irish sea. Whats the problem - its only a 2 knot current to do that ? Or 6 knots if he bobbed along for 8 hours a day. In exactly the right direction? The route plot on the picture doesn't show exactly the right direction as it just shows a northerly route which could just be going with the flow.